Every carnival has a Fun House on the midway. They are virtually maintenance free, simple to set up and tear down, easily framed on a small semi trailer and if you're a show owner, they count as a major ride in your ride arsenal when booking a fair. Here we see a unique fun house on the Goodman Wonder Shows back in the 1930's. It has a large canvas front stretched over a wooden frame. It's too bad we can't see the colorful, elaborately painted bannerline in this photo. It would have been a genuine fun house with lots of tricks, mazes and mirrors inside to delight the public. There were many fun houses, glass houses and shows built like this when cheap help was plentiful. 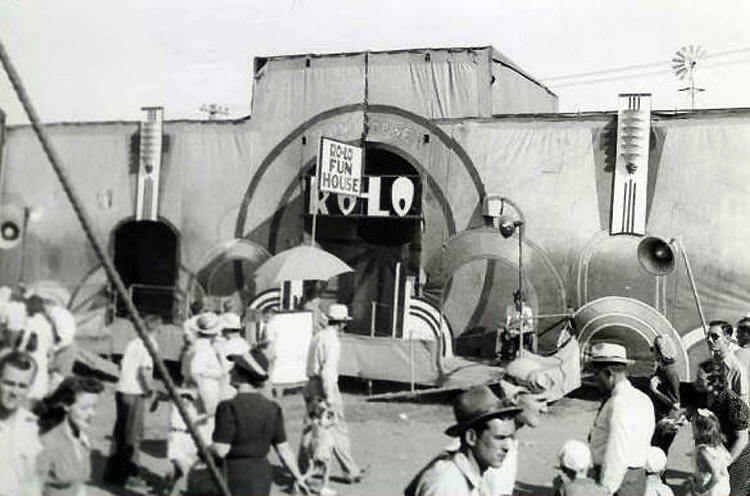 Later, as the second world war dried up the labor situation and used semi trailers became cheap and plentiful, these types of fun houses were abandoned in favor of something one person could easily move in less than an hour.